After popular demand, the Eddie Bravo Invitational is giving the females an event of their own. UFC Tonight announced Wednesday that Justine Kish will make her long awaited UFC debut against Nina Ansaroff January 2nd in Las Vegas at UFC 195. Kish (4-0) was a part of TUF 20, but didn’t fight because of a knee injury. She has a notable win over top contender Randa Markos. This will be her debut at strawweight. Ansaroff (6-4) is coming off a decision loss to Juliana Lima, after winning five straight. The match will air on the preliminary matches on Fox Sports 1. After being passed up for a title shot, Miesha Tate says she doesn’t know what is next for her. Tate was on “The MMA Hour” this past Monday to comment about her situation. Tate hasn’t been in touch with the UFC directly since the announcement or Ronda Rousey taking on Holly Holm, having her management handling communications. She stated she refused the fight with Amanda Nunes not because of Nunes, but because it would be a Fight Pass card, which would mean less money. Tate’s opinion is she is undervalued for facing tougher opponents. Nunes would be a great match for her according to Tate. Tate’s other point was there is no clear path for her to get another title shot. After being promised the title shot after her win against Jessica Eye and having that taken away, she is weary of if she wants to continue fighting; stating a move onto the Fox analyst desk or into movies as an option out of fighting. Tate and UFC President Dana White will discuss Tate’s future in the next few weeks in Vegas. Bellator adds another female match for their 146th card in Thackerville, OK, on November 20. Arlene Blencowe will look to rebound after her loss to Marloes Conene taking on Gabrielle Halloway, who is coming off a loss to Julia Budd. Blencowe (6-5) won four straight before her loss to Coenen and is a world boxing champion. Halloway has a notable win over Andria Wawro and will fight for the fourth time this year. The match joins Julia Budd versus Roberta Rovel on the card, which will stream on the prelims on Spike.com. OneFC announces three female bouts for their upcoming cards. Coming off her KO win over Ann Osman, Irina Mazepa (1-0) will take on boxing world champion Ana Julaton (2-1) at OneFC: Spirit of Champions in Manila, Philippines December 11th. The OneFC card in Phnom Penh, Cambodia December 5th has a pair of atomweight bouts: Tharoth Sam (2-1) takes on Jeet Toshi (2-2), while Vy Srey Chai (0-1) battles Eh Ya Nut (pro debut). Shootboxing champion Rena Kubota will make her official transition to MMA on New Years Eve Rizin card. Kubota will face Italian kickboxer Jleana Valentino. Kubota is a four time shootbox champion and is now training at AACC in Tokyo with InvictaFC champion Ayaka Hamasaki. Valentino has won several regional titles in kickboxing and looks to continue what has been a wave of Italian talent making moves on the world MMA stage. The match joins Gabrielle Garcia facing a yet to be named opponent. TNA Wrestling star Lei’D Tapa, who is training at American Top Team at present, is being considered for the fight. World amateur wrestling champion Kanako Murata is also being consider for the card to make her MMA debut. Part of the Rizin card will air New Years Eve on Spike TV in the U.S. Speaking of making the transition to MMA, Mackenzie Dern has been training at the MMA Lab in Phoenix, Arizona with RFA champ Jocelyn Lybarger and UFC fighter Lauren Murphy to get ready for her first fight in the cage. No word on when that will be. Raquel Pa’aluhi has been training at the Mayweather gym recently to help with her striking. You can see her show some ground moves here. InvictaFC star Sharon Jacobson is going to try to qualify for the 2016 US Olympic wrestling team. The qualifying trials are in December with the team trials being in April. Randi Miller has also expressed interest in trying for the team again as well. Immortal FC has announced two matches for their “Road to Invicta” strawweight tournament. The matches will happen in Paranagua, Parana, Brazil November 11th. Winner of the tournament will get a contract with Invicta. Leah Nidas looks for her first pro win as she takes on Shaena Cox November 14th at Pure FC in Wisconsin. Andy Nguyen looks for her second win and first pro title as she takes on Melissa Karagahnagis for the CUFF atomweight title in Trinidad. 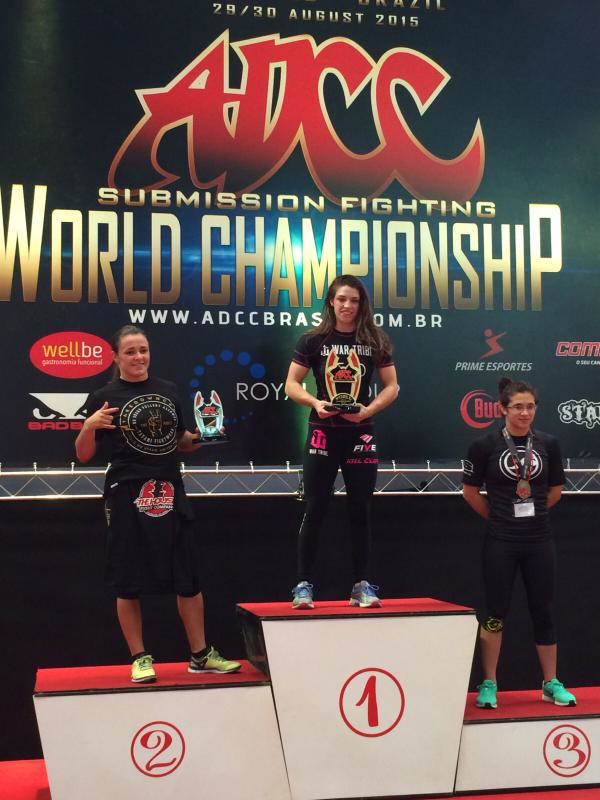 It was a day of upsets and close matches as new ADCC World Champions where crowned. Highlighting what was a spectacular year was Mackenzie Dern, who faced 2013 champion Michelle Nicolini in a hard fought match in the finals. They ended the match ties, but a penalty point for Nicolini sealed the win for Dern who wins her first under 60kg ADCC World title. This was the first time an American has won the title. Dern defeated Beatriz Mesquita by points in the semi-finals. Nicolini defeated Tammy Musucemi in the other under 60kg semi-final. Musucemi would get the rear naked choke over Mesquita to take the bronze. Ana Laura Cordeiro became the new 2015 over 60kg champ defeating Jessica Oliveira by points in the finals. 2013 champion Gracia got upset in the semi-finals, losing to Oliveira. Garcia would gain the bronze via referee’s decision over Amanda Santana. Day one of the ADCC grappling championships saw both 2013 champions advance. Michelle Nicolini is one step closer to a repeat as she got the tap over Japan’s Rikako Yuasa in the opening match of the under 60 kg tournament. Mackenzie Dern was able to get a tap via toehold over Norway’s Kethe Engen. Team USA’s Tammi Masumeci upset Brazil’s Ana Michelle Tavares by points to make her way to the semi-finals, while Brazil’s Beatriz Mesquita armbarred fellow Brazilian Mayra Mazza to complete the quarterfinals. Two time champ Gabrielle Garcia made her way into the semi-finals, as did fellow Brazilian Ana Lauta Cordeiro. US phenom Amanda Santana got a decision win to make her way into the semi-finals. In an upset, 2013 runner up Marysia Malyjasiak was defeated by Brazilian Jessica Oliveira. Day two will see the semi-finals and finals. The ADCC is back and this time in the home country of Brazilian jiu-jitsu. The bi-annual no-gi world championship invitational will start Saturday in Sao Paulo with sixteen women vying for two titles. Michelle Nicollini looks for her second straight title in the under 60 kg category, with a surging Mackenzie Dern looking for her first ADCC World title. In the over 60 kg bracket, Gabrielle Garcia looks for the three-peat with Poland’s Marysia Malyjasiak looking to better her second place finish in 2013. The quarterfinals and semi-finals will stream live Saturday on Budovideos.com starting at 5:30 am pst/8:30 a.m. pst. The finals will stream Sunday starting at 6:30 a.m. pst/9:30 a.m. est. It is $25 for each indivitual day or $35 for both. One of the brightest stars will soon be 18, but has already taken the BJJ world by storm. 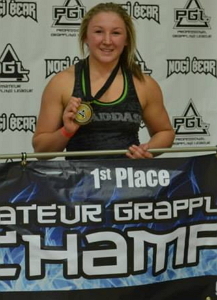 Amanda Leve made national headlines as she was denied taking part of her high school boys’ wrestling team. It hasn’t detoured the BJJ purple belt from making major waves and having the community buzzing about her being the next star in MMA before she even graduates high school. 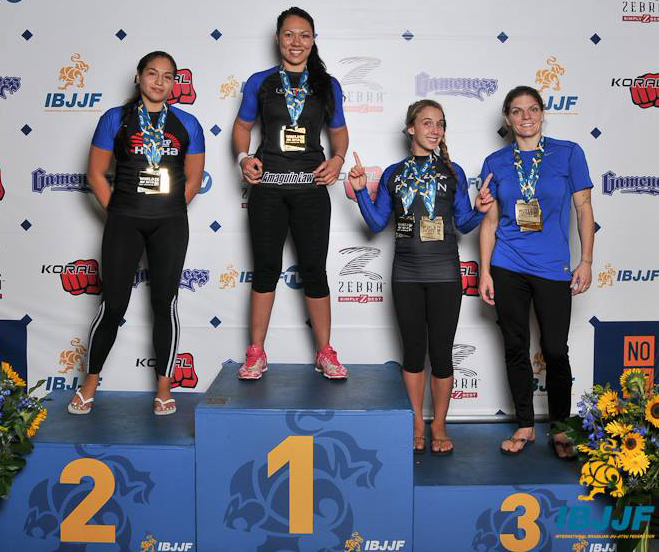 Her biggest test so far was in the Grapplers’ Quest Superfight tournament in July 2014, where Leve (then a blue belt) faced some of the best adult BJJ fighters in the country. 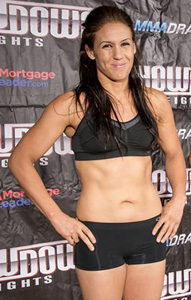 Leve subbed Rahcael Cummins and would have a thrilling 23 minute match with UFC title contender Cat Zingano. We caught up with Leve to talk about her background and her rise in the sport. Wombat Sports: Tells us a little about yourself. Amanda Leve: I have been training for 6 years now. I received my purple belt this past October . I have won multiple NAGA and Grappler’s Quest championships. I hold the women’s absolute title in the Professional Grappling League. Wombat: What got you interested in getting involved in combat sports? Leve: I got involved in jiu jitsu because of my uncle and dad. They both loved watching the UFC and figured since I was athletic that I should try it. My first jiu jitsu class i loved it and stuck with it. W.S. : What do you enjoy about it? A.L. : I enjoy jiu jitsu because it is an outlet for all my frustrations but also a fun active sport that is technical and that I can achieve goals in. A.L. : My friends and classmates think it is extremely cool to be involved in a sport like jiu jitsu. A.L. : My family supports me 110% especially my dad and uncle. My mom always gets nervous with the whole thing. A.L. : I train under Ricardo Almeida. He is an amazing black belt and coach. He cares about all of his students and is willing to help whenever you need him. At Ricardo Almeida’s BJJ it is like one big family. Everyone is so helpful and friendly. Plus the talent at Ricardo’s is world class! A.L. : What comes naturally to me fighting is the competitiveness and learning. 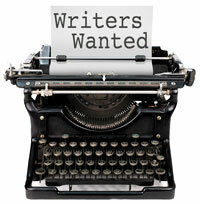 I have always been competitive and I always love to learn new submissions and sweeps. W.S. : It’s been over a year since you were denied to be a part of the boy’s wrestling team. Are you still wrestling outside of school? A.L. : I have been denied to be part of the wrestling team at my school but i never wrestled anywhere I just train at my jiu jitsu school. W.S. : You were impressive last year at the Grappler’s Quest Superfight tournament at the UFC Expo. Can you tell us about being a part of a tournament with such great talent? A.L. : The Grappler’s Quest Superfight was an amazing experience. At the time I was a blue belt. I love submission only tournaments and the talent of the women was amazing. I was honored to be part of such a great tournament. I was able to win my first match by rear naked choke and then I was able to have a 23 minute match with the great Cat Zingano (highlights here). It was a fantastic battle between the two of us. She eventually caught me in a heel hook. She was by far the strongest woman I have ever competed against. A.L. : Frankie Edgar and GSP are two fighters I definitely look up too. Frankie Edgar is a member of my team so it is an honor to watch him train and get ready for his wars. He has awesome stand-up and jiu jitsu. GSP has dedication and fitness like no one else. Plus he has respect for his opponents and doesn’t get arrogant. In the jiu jitsu world I would definitely say Makenzie Dern. She is a young woman black belt with great technical skill. A.L. : The future of WMMA I believe can only get better. Now that women are in the UFC and are getting more publicity soon they will be adding more and more women’s fights. Honestly women’s fights are more aggressive and entertaining anyway! A.L. : I eventually want to fight MMA and am training for it! Right now I am keeping up with my jiu jitsu and entering as many tournaments as I possibly can! A.L. : I would like to thank my dad and uncle for always pushing me in the greatest sport ever! They never let me quit and made me who I am today! I would like to thank my grandparents for always driving me to train when I couldn’t drive yet. I would like to thank my coaches and all my training partners who help me get better each and everyday! Thank you! You can follow Amanda Leve on twitter @Amanda_Leve. Azusa, CA played host this past weekend to the IBJJF No-gi championships which saw over 20 champions crowned. Former InvictaFC champion Lauren Murphy was able to take home a first place in the Blue Belt Middleweight division, while InvictaFC vet Raquel Paaluhi took home the Blue Belt openweight title. You can see results below. (We left out all non-contested weights). In action from Thursday at Tuff-n-uff, Shannon Reid defeated Autumn King by split decision. Deanne Bennett has signed to Invicta. The undefeated flyweight just defeated Colleen Schneider this past weekend, but MMA Rising is reporting Bennett had signed to the promotion a few weeks ago. Bennett also has a win over TUF 18 winner Julianna Pena. She is currently ranked #8 in the Unified rankings. No word on when she will debut with the promotion. The International MMA Federation tournament started this week with several female bouts. The finals will happen Saturday at the UFC Expo. Rachel Abou Abdallah and Florence Berthet received byes. 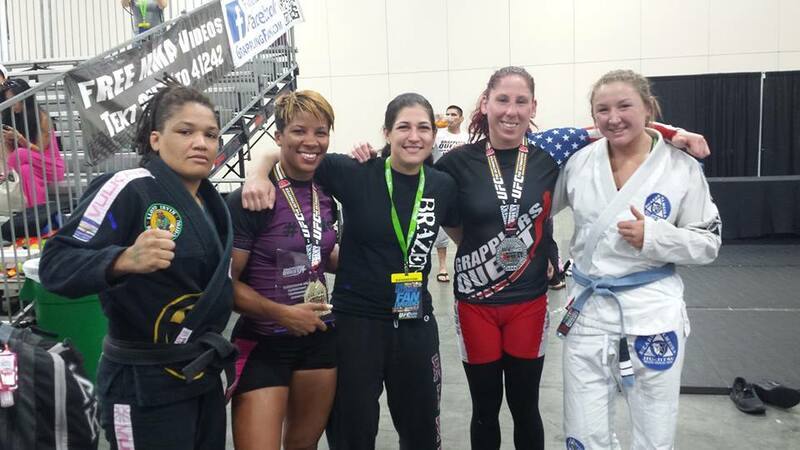 Grapplers Quest will have a all female superfight tournament Saturday at the UFC Expo in Vegas. It will be no time limit until someone taps. UFC fighter Cat Zingano and pro MMA flyweight Rahcael Cummins are set to take part. Here is the quarterfinal bouts. Winner will be crowned the same day. Kickboxing and Muay Thai champion Jemyma Betrian will make her transition to the MMA in August. Betrian (29-2-1 Muay Thai; 35-2-1 overall kickboxing) will face a yet-to-be-named opponent at Choas at the Casino 5 August 10 in Inglewood, CA. She KOed Christi Brereton in her last match this past month at WCK Muay Thai in Temecula, California. She is currently training with UFC champion Rhoda Rousey. She will be fighting at strawweight. The main event will feature Marina Shafir taking on Nikita Netjes. No word on if this will be streamed. Lívia Renata Souza will be staying busy this summer before her fall debut in Invicta. Souza is fighting on Aug 21 against França Godoy at X-Fight MMA in Sao Paulo Brazil. Cage Warriors did a great retrospective on Rosi Sexton this past week. It covers her promotional career from her first fight to her retirement from the sport this past month. You can watch it here. 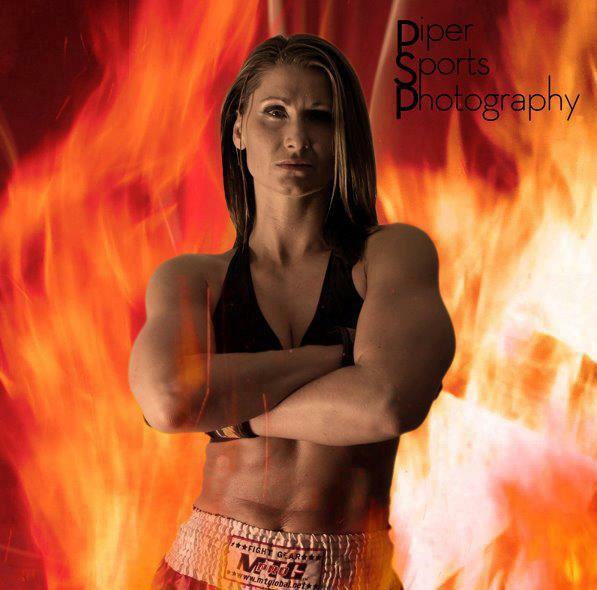 On the podcast Sunday at 1 p.m. pst/4 p.m. est, we will be talking to Charmiane Tweet who is looking to return to Invicta, preparing for her boxing debut, and started to invite fighters from across North American to train with here. You can listen live here on Sunday. InvictaFC 8 is now looking at a September date. Most likely date is September 20, the same day Miesha Tate will face Rin Nakai in Japan. Since that card will be on Fight Pass (and out of the country), would make sense to help promote the channel. By the looks of it, UFC fighter Leslie Smith maybe an assistant coach for TUF 20. Gilbert Melendez and Smith have trained a great deal together. UFC champion Ronda Rousey has her toughest challenge to date (in her own words) against Alexis Davis Saturday at UFC 175. The fight has become about “BJJ vs. Judo”, as Judo black belt Rousey wants to prove her art is better than BJJ. Davis is a black belt in Japanese and Brazilian jiu-jitsu, and feels her skills on the ground will be able to negate the armbar, and she will tap Rousey. Both weighed in Friday, with Rousey (135) and Davis (135) both coming in on weight. The match will serve as the co-main event and will be live on ppv Saturday. On Sunday, Sarah Moras and Alexis Dufresne will make their octagon debuts at The Ultimate Fighter 19 finale in Vegas live on Fox Sports 1. Moras has a win over TUF 18 winner Juliana Pena, which Pena avenged in the semi-finals of the show. Moras went undefeated as an amateur and finished in all of her pro wins. Dufresne (5-0) has finished all of her opponents in the first round with her longest match being 2:20. She got a 45 second TKO over Kim Couture in February, and will look to make her bantamweight debut in the UFC. The match is set to air on Fox Sports 1 on the preliminary portion of the card. Shannon O’Connell and Bronwyn Wylie will battle for the vacant WIBA super bantamweight title in Victoria, Australia. O’Connell (9-3) will be dropping in weight for the bout, having been the WBF featherweight champion. She has five KOs to her credit. Wylie (3-2) is looking for her first world title.